Long French Art Deco exotic Macassar ebony "diamond inlay'' sideboard/buffet, circa 1940s. The sideboard are in very good condition, with 2 drawers inside, and with 6 shelves adjustable, and bar section, you can remove all the shelves if you need more space, beautiful bronze hardware detail. Please note these buffets can be taken apart to accommodate elevator needs if necessary. We traveled to buy all our pieces in France. We bought this beautiful Macassar sideboard in Paris France. the sideboard is in very good condition. 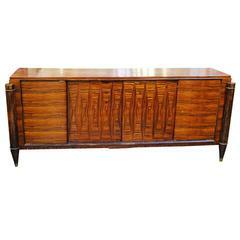 This stunning French Art Deco exotic Macassar ebony buffet or credenza, circa 1940s. Interior finished in lemonwood. Perfect any room in your house.